It's far too easy to blog about gardening successes and post pretty pictures, but that is not the reality most of us gardener face. So, today, I'm airing my dirty laundry and will take you on a tour of what has not gone to plan in my cottage gardens. I should have followed some advice (unless I'm just dreaming I read this somewhere) to pinch back my Shasta daisy's. Last year they were about three ft high. This year, they are four feet. The intention was to have a tall feature in these front beds, but this is really too much. 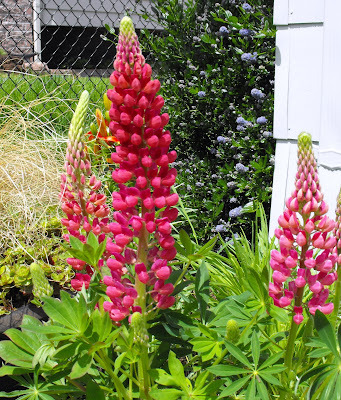 Next, we move to the delightful purchase I made in May of a gorgeous hybrid lupine, called Gallery Red. Clearly this baby was at it's peak of glory when I purchased it. I've got ugly seed pods and wilted foliage now. It has rained frequently and I also watered regularly in between. I guess it's just a fickle plant. I do see new growth but I suspect this plant is going to require extra TLC if it will survive any freezing temps in winter. 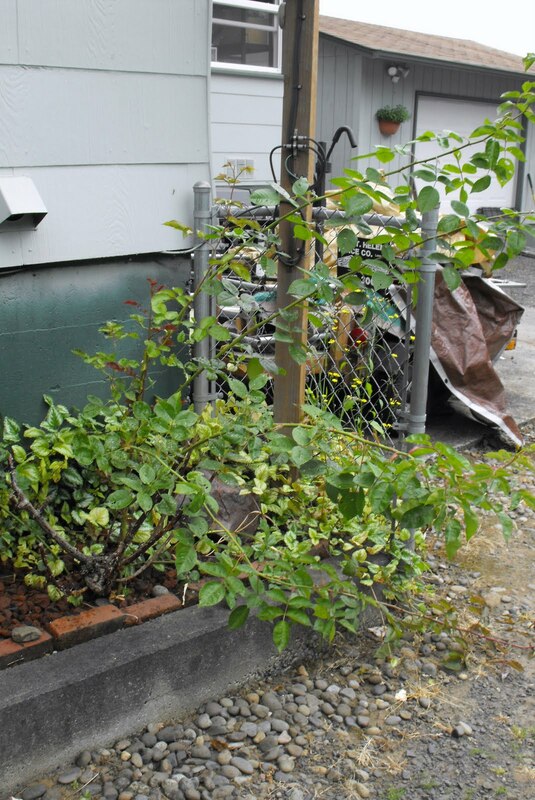 Next, my poor neglected roses. One in particular is quite sad and frankly just needs to be pulled out. Is that REALLY a rose you ask? Yes, it was a pretty hybrid tea called 'Peace'. I pruned well last fall but neglected to cover the root balls. 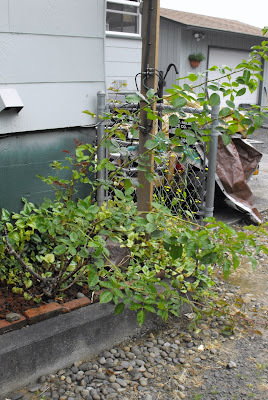 The past winter had prolonged periods of freezing temperatures and I lost one rose completely and this rose while it produced one proper growth, has put most of it's energy pumping out new shoots, not attached to the root ball. It's all together ugly. I need to bite the bullet and just yank it out. In May, I worked on a few project I called 'The Wood Cutters Garden' due to it's proximity to our firewood pile. It was very promising upon completion. I underestimated the slugs in this shady area. None of the seeds I planted have had much of a chance. As well, the birds are been quite unkind. The neighbors property is on the other side of the fence and they have a few bird feeders that attract a large contingent of finches and sparrows. I'm going to have to re-think what plants I try in this area. Thus completes my tour of the not-so-good, bad and terribly ugly in my garden. I'm always reminded that a garden is a constant work in progress and a continued lesson in humility. 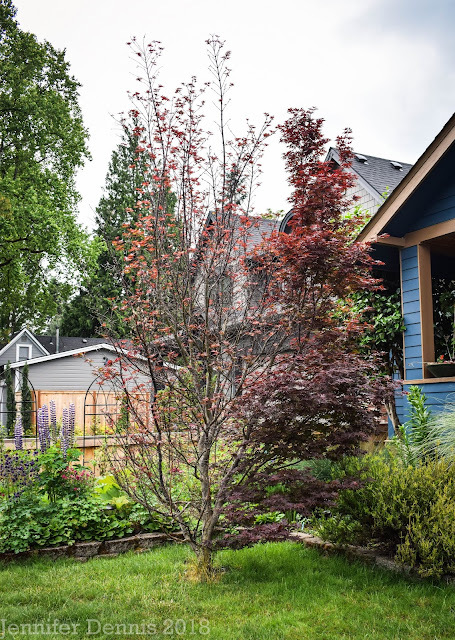 A popular garden writer local to the Portland, Oregon area has past away. Her beautiful writing style and sense of humor will be greatly missed. Rest in Peace Dulcy Mahar. I'm glad I'm not the only one showing the ugly in my garden lately. I wonder if it's just the time of year, the first flush of spring is done, and things are kind of taking a deep breath before they start flowering for summer. If you don't want to save seeds from the Lupine, you can probably cut it right back to the ground, and it will put out new leaves that will look much nicer. Sorry about your roses. I have stayed away from them because they intimidate me. I have a lot of ugly in my garden. You're right. Always getting lessons in patience and humility. What I love about gardening is you're never finished, it's always changing. What I hate about gardening is you're never finished, it's always changing. Sounds like your rose has reverted back to Dr. Huey. I hate when that happens! Thanks for the tip Alison..I will just cut it back! I agree with Alison and would cut back the lupin to see if it will send up fresh growth. The trouble is that garden centres etc. seem to bring plants on too early so that people are tempted by the lovely flowers. At least you don't have sunburned radishes! :) My lupines do that too...the cutting them back helps. There is always an ugly part of the garden I think...that's part of the never ending challenge. Hi Jenni. I think we could all show pictures like this, at one time or another over the summer. And probably at several different times! I'm like you with the lupines. I don't have any because of it, but I like Alison's advice on just cutting them back after blooming. Maybe just leave one for the seeds? They say if you love perennials, you have to learn to love green also, because no matter how you plan things, you always have times when not much is blooming! Dulcy passed away? Oh this is terrible news. I loved her writing. She will be sorely missed for sure. Thank you for sharing it. I haven't logged on to the Oregonian website for awhile now. 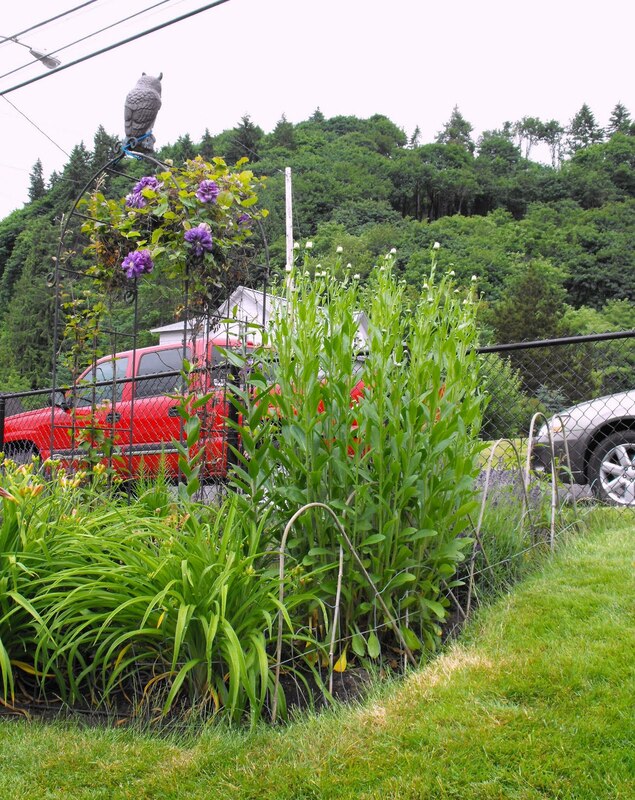 Yes there are those areas and plants that disappoint. 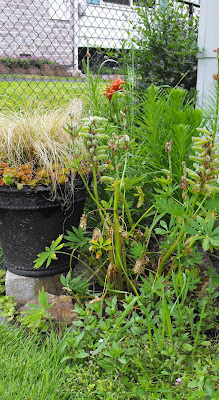 My 'Gallery' Lupine never made it through the winter. My 'Peace' rose years ago was yanked due to persistent blackspot. It's all a work in progress for sure. And when one door closes another opens. I look forward to seeing how you amend your side garden. [It doesn't look half bad to me but I totally understand when an area doesn't perform how you expect it to.] Happy 4th. Hi Jenni, doesn't look too bad! I agree with Alison, cut back the lupin. It might not flower again this year but at least you might get some healthy foilage. 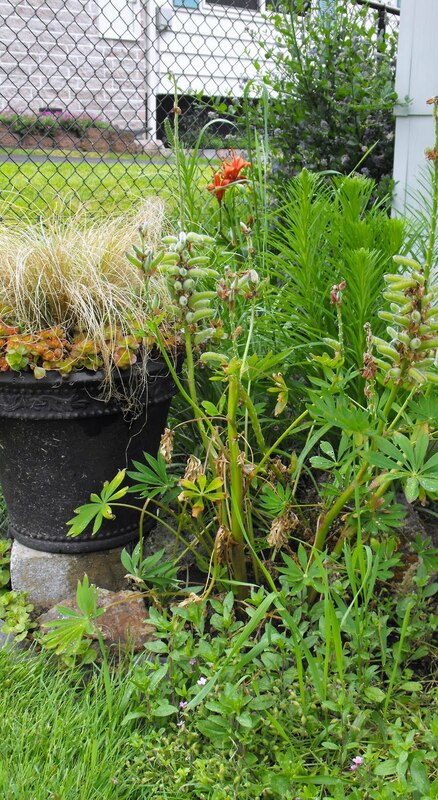 Next year, I suggest deadheading your lupin, as soon as the flower is looking spent; snap it off being careful not to take it off too low (as you'll see new flowers developing mid way up the plant). If you deadhead you should get a 2nd flowering but they'll be much smaller flowers. Once my plant is finished flowering I leave it for the foilage unless its looking unhealthy and then I would cut it back. You could grow more lupin from the seed pods that have formed. I'd do this in pots rather than in the ground and protect from slugs. 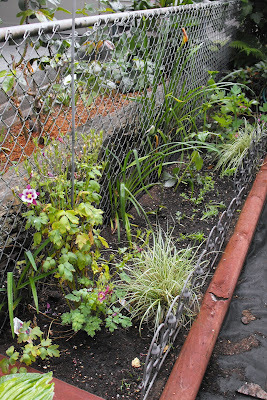 I use some slug pellets around flower seedlings as otherwise I'd have no plants (darn slugs). OH we all have lots of ugly moments in the garden. Maybe your bravery will encourage me to show off more of my weeds! For sure cut the lupine back and I am positive you will be rewarded - lupine is a native that can withstand plenty of winter cold and summer heat too! It will be beautiful again. You are brave! 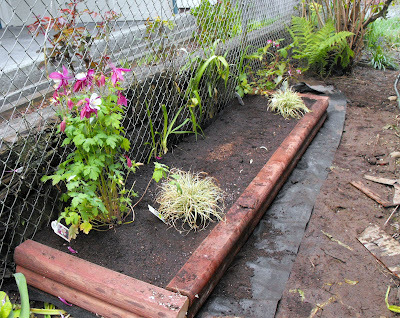 I will not show my East side bed until success is achieved and that may be never. I think you are underestimating the woodcutter's garden. Remember the first year they sleep. I like that you raised the bed. Sorry about the roses. I have always wanted a Peace Rose, but alas my zone forbids it. I lost 3 this winter (drat make that 4). Thanks for the post. Hope you are getting some sun.